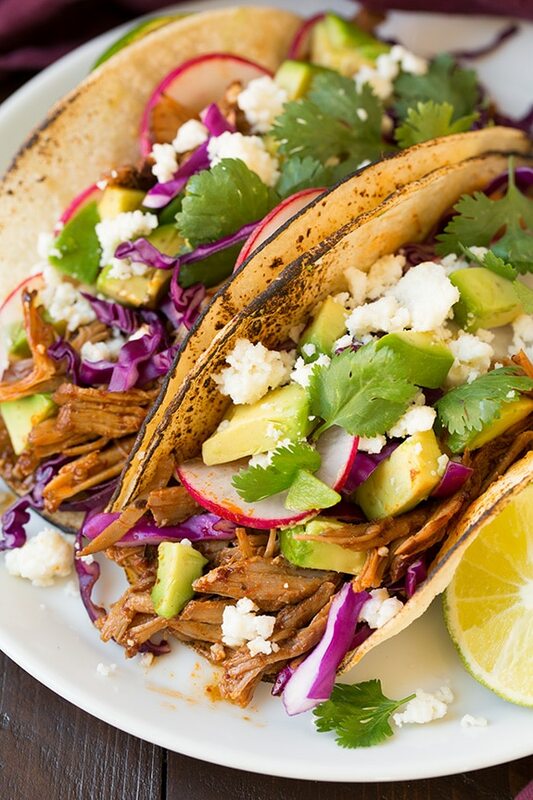 Are you ready for some of the best tacos of your life?? Then try these now! They taste like the tacos you’d order at a really good Mexican restaurant, and dare I say even better! 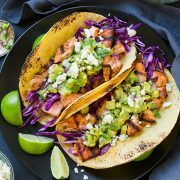 My whole family, kids included, absolutely loved these tacos!! We couldn’t stop raving about them and how good they were and my kids even asked for more – which never happens just because they don’t eat big portions in one sitting, they’re snackers. 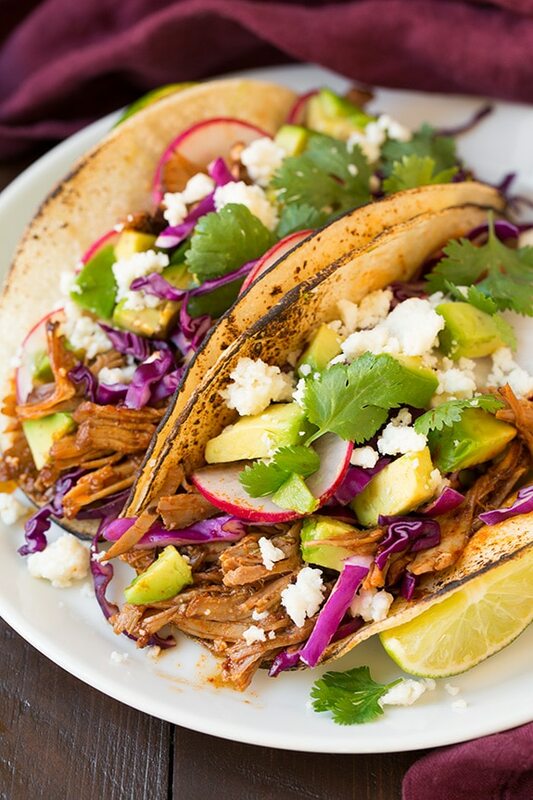 My mom, my husband and I all agreed they are our new favorite tacos and that’s big around here considering how much we are all such taco fanatics! I think I finished off about a quarter of the pork just as I was shredding the pieces. I couldn’t stop reaching for another. The flavor is authentic and unique and it will most definitely leave you craving more. I wish I could take credit for this awesome recipe but of course, it’s a Food Network recipe and it got rave reviews there too. I changed little things, like using a yellow onion instead of white, reducing the broth by 1/4 cup (so you only had to use 2 cans vs. part of a third) and regular olive oil versus extra-virgin (not sure why they would have used it actually because it has a more powerful flavor and it’s not intended for high heat and sautéing, plus it’s rare you find it in Mexican cuisine as far as I know). I also started off with less salt because I’m not big into super salty foods and I did trim some of the fat even though it wasn’t suggested and I used a food processor for the sauce because it worked better than a blender did. Then after shredding the pork I opted to return it to the slow cooker with that flavorful sauce so that the flavors could soak into each piece. Other than that I made them as stated (which is rare for me) and I’m so glad I did. I was tempted to throw in a little of this or a little of that but it honestly doesn’t need anything else! This pork is spot on delicious! My mom and my kids, who don’t like spicy foods, had no complaints about the slight spiciness with these tacos. However, there were a few reviews I noted saying they were too spicy. 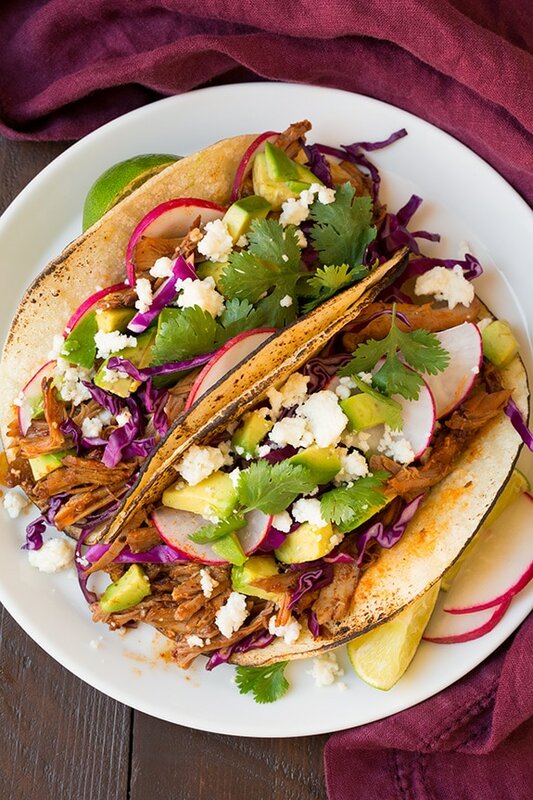 So, if you don’t like spicy at all this may not be the recipe for you (instead you could try the Shredded Beef Taco recipe I have posted and serve them with a mild salsa). 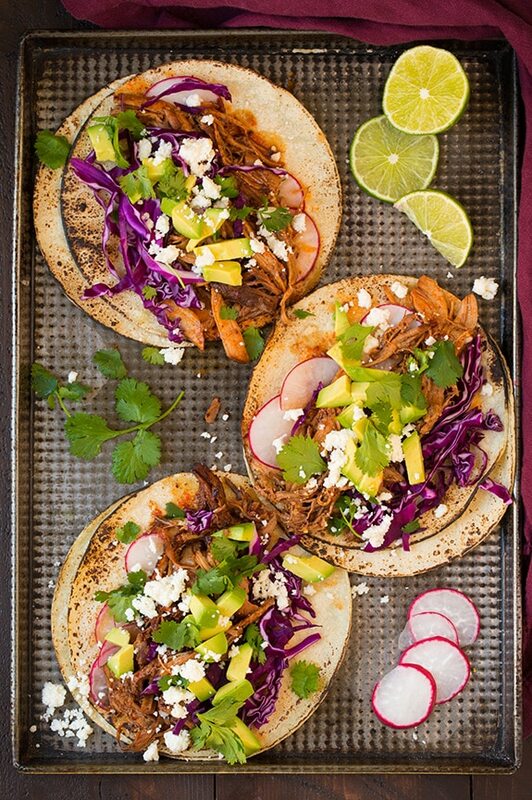 Just be sure to load these tacos up with all the that listed goodness… although I think I’d be happy just to eat a bowl of this pork. 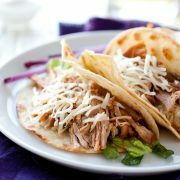 Deliciously tender and flavorful slow cooked pork tacos! Brimming with delicious Mexican chilies and spices and sure to satisfy. Layer in tacos with all your favorite toppings! Place ancho chiles, pasilla chiles and unpeeled garlic in a microwave safe medium mixing bowl, pour 3 Tbsp water over peppers then microwave on high power, 2 - 3 minutes until peppers are soft and pliable. Meanwhile add chipotle peppers, yellow onion, 2 Tbsp olive oil, the honey, cider vinegar, oregano and 2 tsp salt to a food processor. Remove peppers from microwave and stem and seed them, then add to food processor. Peel garlic and add to food processor. Pulse mixture until well pureed. Heat remaining 1 Tbsp olive oil in a large skillet over medium-high heat. Pour sauce into skillet (scrape out any excess with a spatula) and fry until well thickened and fragrant, about 7 - 8 minutes (it should be like a thick tomato paste). Pour in broth, bring to a boil then reduce heat slightly and simmer until slightly thickened, about 15 minutes (note that sauce can be made the night before and stored in the fridge to save prep time in the morning). Trim large pieces of fat from pork roast then cut into chunks (about 6 - 8). Season pork all over with salt and pepper (just keep in mind you can add more salt later but can't take it out, so go lightly with the salt, especially considering there's plenty in the sauce mixture). Place pork in slow cooker then pour sauce evenly over pork, submerge bay leaves and cinnamon stick into sauce. Cover and cook on high 5 hours, or until meat is tender. Remove bay leaves and cinnamon stick. Remove pork while leaving broth in slow cooker. 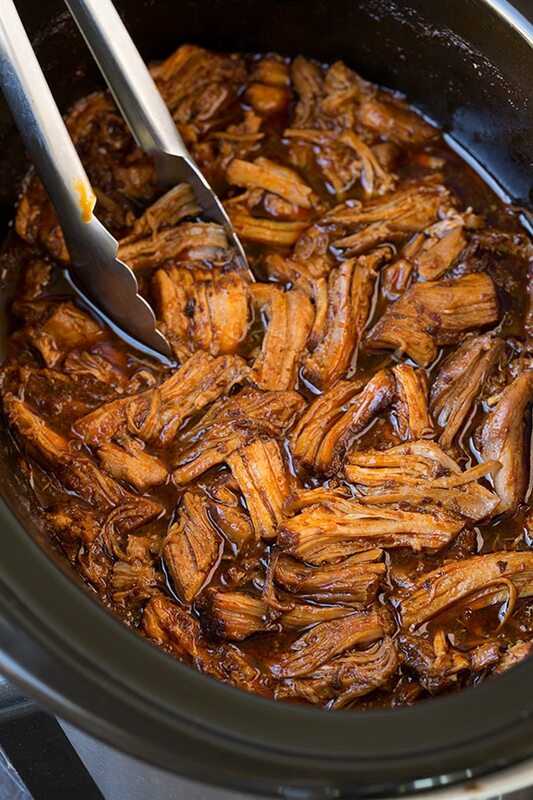 Shred pork and remove any fat while shredding. Ladle out as much of the fat from the top layer of broth (the greasy layer on top) as you can, return shredded pork to broth mixture (at this point you can add more salt if desired) cover and cook 30 minutes on warm or low to allow flavors to infuse into each piece. Serve warm over tortillas with toppings listed. This recipe looks great but I have two questions. I’d like to only do 2 lbs of pork since it’s just me and my boyfriend. We never get through the leftovers. Should I keep all the other measurements the same and just have extra sauce? Or half it? And should I lower the cooking time?